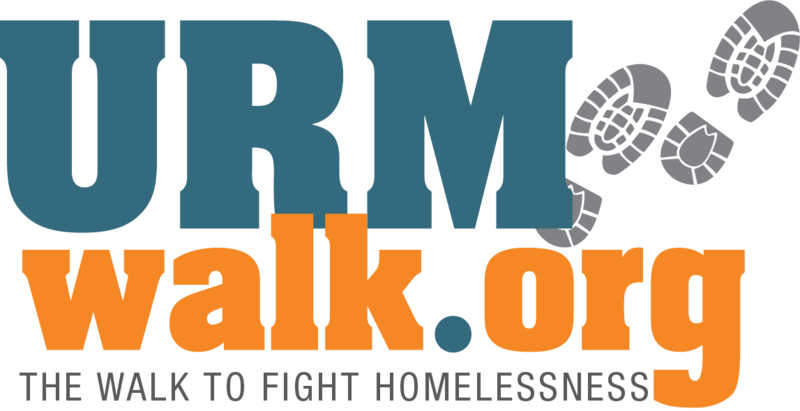 JOIN THE WALK TO FIGHT HOMELESSNESS, SATURDAY MAY 11, 2019! Join CEO Andy Bales and Union Rescue Mission as we host our 2nd annual 5k Walk to Fight Homelessness in Los Angeles. Homelessness is devastating communities nationwide, but nowhere more than in Los Angeles. 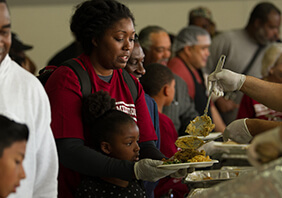 We now have more than 52,000 men, women, and children living on Skid Row and throughout Los Angeles County each day. This is your opportunity to turn your compassion into action. We would like to invite you to join us for our 2nd annual 5k Walk to Fight Homelessness. Registration is free and proceeds from the walk will go toward the continuation of our life-saving programs and services to help those experiencing homelessness find their way home. 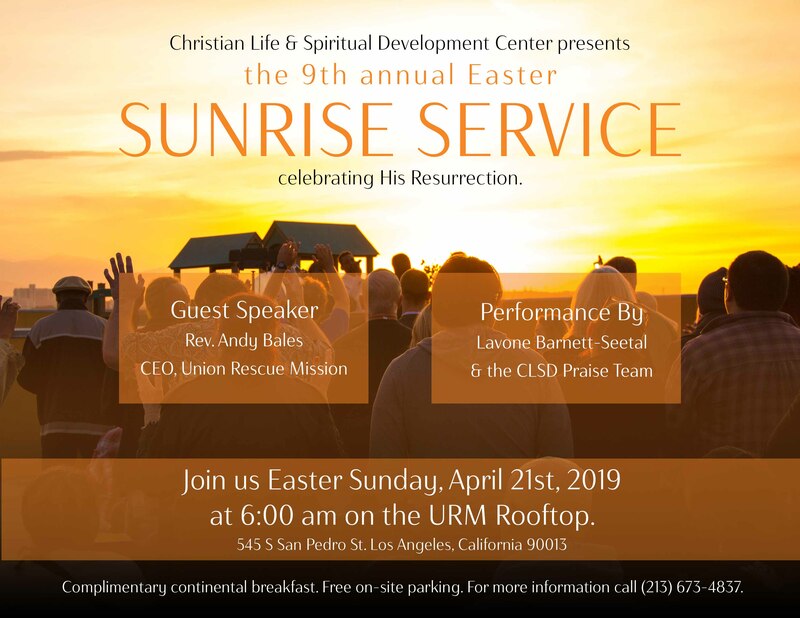 Join us for the 9th Annual Sunrise Service. This inspiring event occurs once a year on Easter Sunday to celebrate the Resurrection. Enjoy free underground parking and a complimentary continental breakfast following the service. 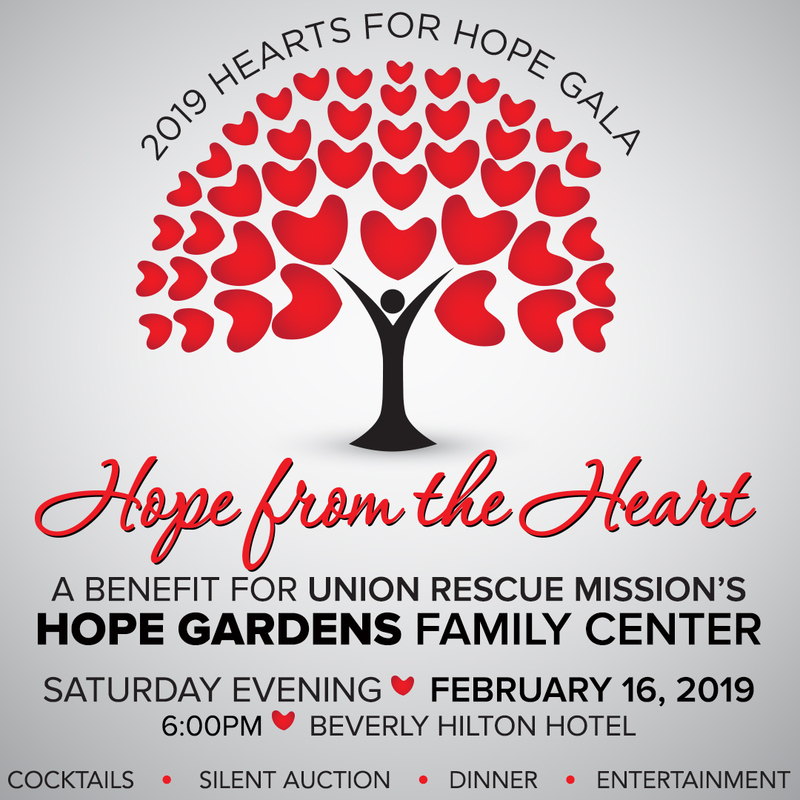 Join us for an elegant night of “Hope From the Heart” on February 16, 2019 at 6:00PM. 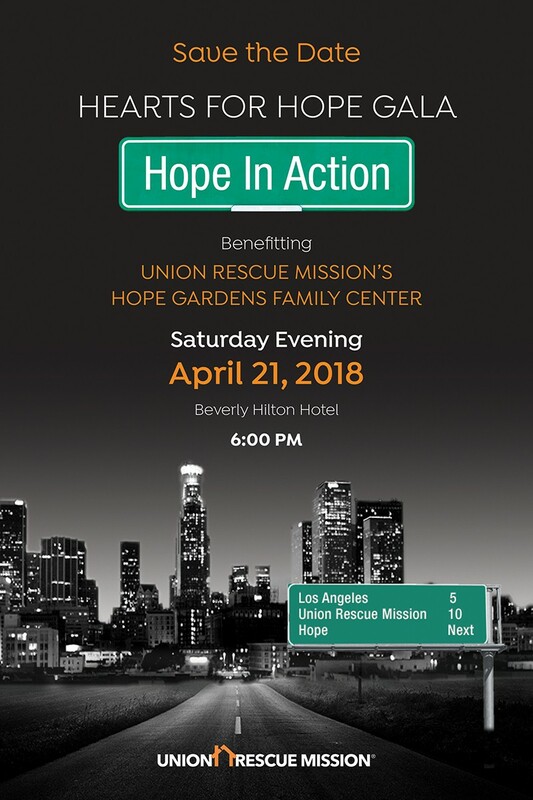 We will gather at the luxurious Beverly Hilton to raise awareness and funds for Hope Gardens Family Center, where precious families and seniors have a safe place to live while they receive counseling, job training, case management and encouragement. The evening will include celebrating success stories, honoring supporters, a three-course meal, silent auctions and more. 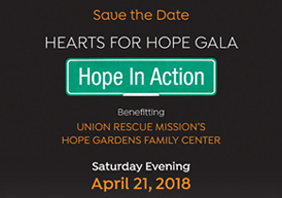 All the proceeds raised for this event will benefit Hope Gardens Family Center’s life-transformation programs to help women and children escape homelessness for good. We would like to invite you to be a part of our 2018 Turkey Fry Day and Thanksgiving Meal celebration. Turkey Fry Day is held the Friday before Thanksgiving, and the Thanksgiving Meal celebration occurs the Saturday before Thanksgiving. Volunteer positions include frying turkeys, serving guests, hosting tables, decorating, assisting in registration, and more. Volunteer sign-ups are now available for Turkey Fry Day. Please visit URM Volunteer Portal to register. We look forward to seeing you this Thanksgiving! 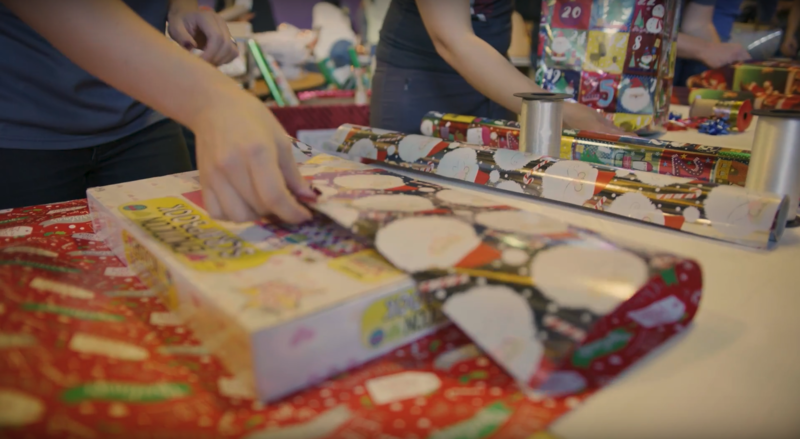 Christmas in July will feature fun games, prizes, and face painting! 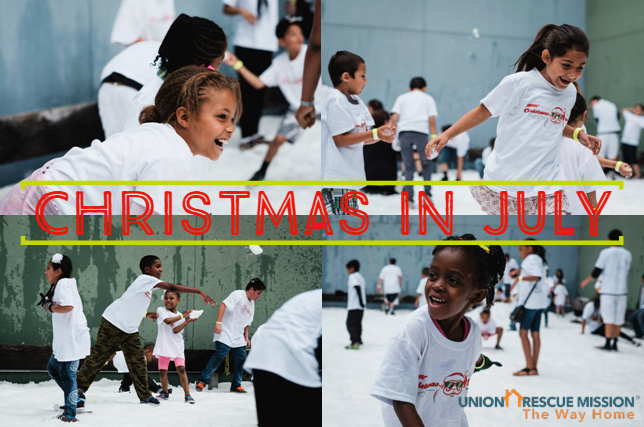 Over 200 kids of all ages from URM and Hope Gardens Family Center will experience a winter wonderland in the heat of summer. For many of the children, this will be their first time seeing snow and experiencing the joy of a snowball fight. There will be fun activities, delicious food courtesy of our sponsors, and more! 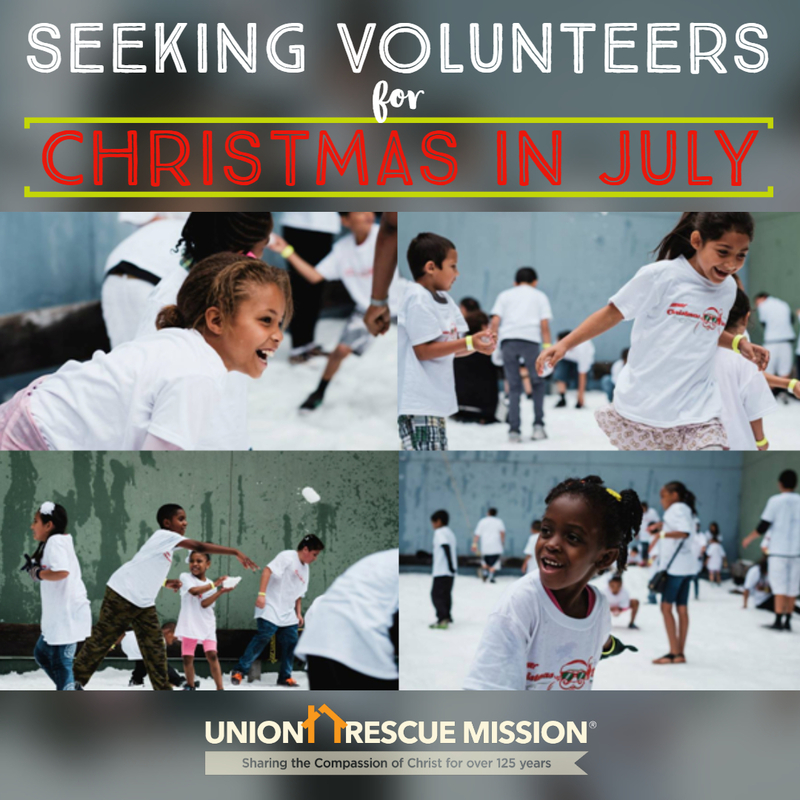 Location: Union Rescue Mission – Downtown L.A.